So began the plaintive lyric of a 1937 blues which was to produce from the black record buying public of the day a measure of adulation and fame for the then unknown, Texas blues singer Curtis Jones. The song, "Lonesome Bedroom Blues", was to remain in Columbia's catalogue until the demise of the 78rpm record in the late fifties eventually to become a "blues standard" in the repertoire of a new generation of bluesmen and their white copyists. The originator, despite various attempts by enthusiasts to promote and re-record him in the sixties, was to die a forgotten, sad and embittered individual. One of seven children Curtis Jones was born on August 18,1906 in the sharecropping community of Naples, Cass County, Texas. His early child hood was much the same as that of other black children of the day; as soon as he was able he was working in the fields, but in Curtis's case his time came quicker due to the death of his mother in 1912. By the time he reached his teens he had suffered sufficiently from the sharecropping regime - "Sometimes you have a good year and sometimes a very bad year. In my father's condition all of his years seemed very bad. The kind of shelter was a tumbled down log cabin where you had to stuff the walls with rags in the winter season to keep from freezing to death" (1) - and fled for the big city of Dallas. Once there he used the guitar technique he had been teaching himself as a child as a basis for playing the organ or piano at a variety of local venues. Eventually meeting up with pianist Alex Moore, he claimed to have recorded with him "about 1925", but this session, if indeed it took place, has yet to be identified. In 1929, Curtis Jones left Dallas working his way through the Mid and Southwest via Kansas City, then travelling to New Orleans where, it would seem, he married a girl called Lulu Stiggers, and finally joining various performing troupes enroute to Chicago. Arriving there in 1936, he formed his own group and began playing at rent parties and in Southside joints or bars. Soon he was spotted by Vocalion talent scout Lester Melrose, who had been responsible for getting recording contracts for many of the great names of the day, including Big Bill Broonzy, Tampa Red and Washboard Sam. Melrose arranged a recording session on Tuesday 28th September 1937, and accompanied by Willie "Bee" James on guitar and Fred Williams on drums, Jones cut four titles of which only "Lonesome Bedroom Blues" and "You Got Good Business" were released. The former title was apparently written as a eulogy for his wife, who had recently died and was a monster race hit, so much so that another Chicago label, Bluebird, "kidnapped" him for a recording session the next month, releasing the sides under the pseudonym of "The Texas Wonder". Over the next five years Curtis Jones was in the studio no fewer than twenty times, recording some hundred titles. None, however, was to prove as popular as "Lonesome Bedroom Blues" although he did have passable sales with "Highway 51 Blues" and "Bull And Cow Blues". The recording company even teased out of Jones a "Lonesome Bedroom Blues No.2" and "I Feel So Good In My Bedroom" in an attempt to get as much mileage out of the tune as possible. Outside of his studio work, he played club dates with a band which comprised tenor, trumpet and drums - a line-up which, Jones revealed in later years, he preferred to the setting of guitar and drums he was forced to work with in the studio. Ironically, the only side he cut for Melrose with a trumpet in the line-up (played by Punch Miller who had recorded with Big Bill Broonzy) was never issued. 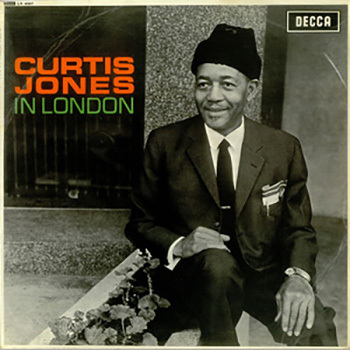 However, by 1941 Curtis Jones's record sales were on the wane and that, coupled with a disagreement with Melrose, led to Jones working outside of music in unspecified day jobs. It wasn't until 1953 that he recorded again. Bronzeville Record Manufacturing Co., a company formed by disc jockey Al Benson, had released on the Parrot label recordings of jazz and swing musicians like Coleman Hawkins and Herbie Fields. Jones was Parrot's first bluesman (later they recorded Albert King and J.B. Lenoir) but the four titles he cut failed to bring him any renewed recognition and he had to be content with playing local club dates for the next few years. Three days later at the instigation of fellow pianist Champion Jack Dupree (c.f SEE 44), Curtis Jones was on a plane to Zurich, Switzerland. From that moment on he became, like Dupree, a Eurobluesman eventually making Paris, France his base. He toured France, Belgium and Germany where, in January 1963 at Koblenz, he appeared in concert with a variety of other expatriate jazz and bluesmen to celebrate American's In Europe; a concert which was subsequently to appear in its entirety on a double album (Impulse LP 1037). Later that year saw Curtis in London with the Chris Barber band at many jazz and blues venues throughout the town. In November 1963 Curtis Jones, guitarist Alexis Korner, bassist Jack Fallon and drummer Eddie Taylor got together in Decca's West Hampstead studio to record this, his third album. The choice of material tends to reflect the music he had been playing for his European audiences numbers like "Young Generation Boogie", which leans heavily on Ray Charles's instrumental "Rockhouse", or "Syl-Vous Play Blues" which is sung and played very much in the Memphis Slim vein even down to Slime's habit of attempting to sing in French. "Alley Bound" is a version of his 1938 original, a song he had reworked in 1941 as "Tin Pan Alley Blues", only for it to be given the definitive modern treatment in 1953 by West Coaster Jimmy Wilson, with whom it is usually, if wrongly, identified. Elmore James's theme tune, "Dust My Broom", although treated to an eccentric slide guitar accompaniment, is given new meaning with some refreshingly inventive piano playing, evoking a whole host of Texas pianists of a bygone age. Curtis Jones's first titles of 1937, "Lonesome Bedroom Blues" and "You Got Good Business" are sympathetically recut here and, bearing in mind that almost thirty years had elapsed between these and their precursors, "Lonesome Bedroom" is still as haunting as it ever was. In his previous two decades of recording Jones had never been committed to record playing his first instrument, the guitar. On this compilation he reveals an unexpected talent with his guitar accompaniment on the East Coast standard "Red River Blues" (probably learnt from a Josh White recording) and his own composition "Skid Row" with its echoes of Big Bill Broonzy's picking in his latter days. Curtis Jones spent the next two years in North Africa, mainly Morocco, then toured Spain, Greece and finally France between 1966 and 1967. In 1968 he was part of the American Folk Blues Festival which toured England and while here recorded an album for Mike Vernon's Blue Horizon label, appropriately entitled "Now Resident in Europe" (7-63207). The album failed to get the promotion, sales or acclaim Jones obviously thought it worthy of, as he made clear at the time. He then returned to Germany, spent the following three years working concert or club dates in Europe, and died unexpectedly from a heart attack at the Schwabinger Krankenhause in Munich, Germany. He was buried nine days later in a Sozialgrab (pauper's grave) at the Perlacher Forst Cemetery. Eight years later his grave was sold because no one had paid for its upkeep. Curtis Jones never did enjoy the acclaim or recording contracts that fellow pianists Memphis Slim, Jack Dupree and Willie Mabon found abroad. The re-release of these British recordings puts back into catalogue a significant part of Curtis Jones's very prolific recording career as some small measure of redress. 1) Interview with Neil Slaven published in R&B Monthly, March 1964.